Core values: the words that propel a company to great heights. Simply place them on the “about us” tab on your company website, hang a sign on the break room wall, and periodically send an email as a reminder – right? I think we all know it doesn’t happen that way. The purpose behind the existence of company values seems elementary in concept, but why is it so easy to miss the mark in the creation and execution of a value system? A set of values can mold and guide an organization’s behavior, but they can just as easily be a culture robber. When I say culture robber, I’m alluding to company values being used as a policing tool versus a performance tool (more to come on that). 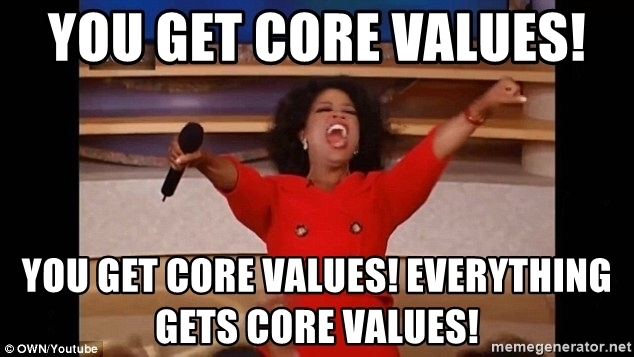 Until recently, I didn’t understand or appreciate the potential impact of having core values, nor the process of developing and introducing them to a company. It takes work, patience, and even more work to create a strong, authentic set of core values for your organization. When present, core values guide your culture by impacting everything from daily decisions to how you treat others, and also extend to hiring and managing. In the past month, two mega companies have released commercials speaking to their values the wake of major crises. One organization lost the trust of its customer base and the other lost the trust of its employees, shareholders and customers. Now they’re in damage control to reestablish their company values. These crises, however, could have been avoided or mitigated with a stronger, more consistently applied set of company values in the first place. As a result of having a core value system, the behavior of your team is molded by what the organization values – both good and bad. Before we move ahead, a word of caution to those in companies that already have a set of values. If you feel your company values are lacking, or are not an accurate representation of the values that truly define your company, tread lightly when trying to influence change! Depending on how the values were created, there very well may be deep-rooted connections to them. When creating or re-establishing Core Values, use the power of your workforce to help identify what is truly valued in an organization. One common theme you will see in my posts: “People support a world they help create.” This is especially important in this type of initiative. Are the values those of your CEO/C-suite? That’s where the first error can occur. 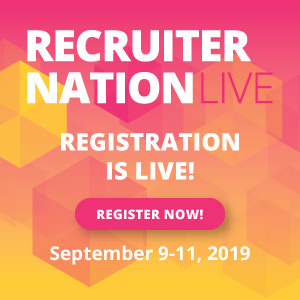 Make this an inclusive initiative in an effort to create Core Values that most accurately reflect your entire organization. This is where I experienced my first roadblock. In our effort to set our Core Values in stone, a few members of our senior leadership team initially focused on the values they saw as important. That was a mistake and caused serious pushback because we didn’t include enough of our employee base to gain support and adoption. Once we took the route of facilitating a values meeting with a larger group of employees, the momentum began to build. Core Values are often paired with both the Vision and Mission of your organization. A Vision statement outlines what a company desires to be and the direction it’s headed. The values should be “who” you are and what values are important to the people that make up the organization. Often, Values end up being what a company wants to be rather than who they actually are. Fortunately, that’s why you have a company vision can be revised over time. In an effort to make ensure values truly speak to your employee, try to make the values authentic to the company. A great way to do this is to track feedback from focus groups during the development stage of core values. The process of gaining buy-in from your team is a large undertaking and one that takes an ongoing internal marketing campaign. 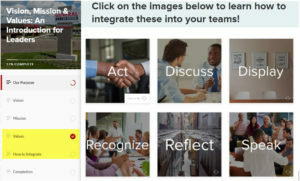 The first step is educating your employees and positioning the Core Values between them and their daily lives at work. Before rolling the values out company-wide (in our case to 1,700 employees), first target every leader to ensure they understand the meaning and goal of the Core Values. This allows for them to actively apply the values and also to influence the adoption process for employees. In addition to an all-hands meeting and marketing materials (print, video etc), we created an online learning module that engaged the employee by giving them real world examples of how to learn and implement the Core Values. Use ’em or lose ’em. All of your work can go to waste if you fail to incorporate these in all areas of your company. Having Core Values can help set expectations for employees but don’t fall into the trap of using them primarily as a policing method when employees aren’t exemplifying the values. If the values are looked at as a set of “laws” they are no longer values, but rather bylaws. Accountability – Hold yourself and teams accountable to values. Terminating an employee is never fun and when everyone is held accountable to your Core Value system it brings clarity to the hard decisions you may be faced with. I recognize that everything I just covered is a long-game and it can’t be achieved overnight. Hopefully this can serve as a guide to define your Core Values and turn them into something other than just a poster on the wall.